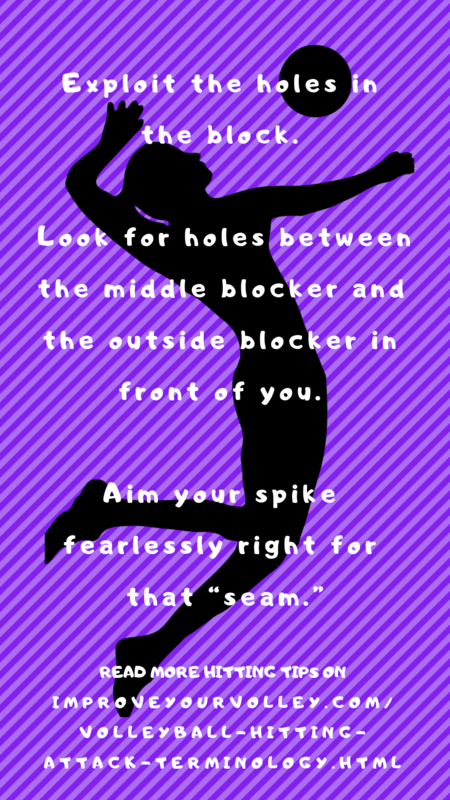 Learn ways to hit to score for points against a double block by aiming for the seam, using the blockers hands and hitting deep corners. 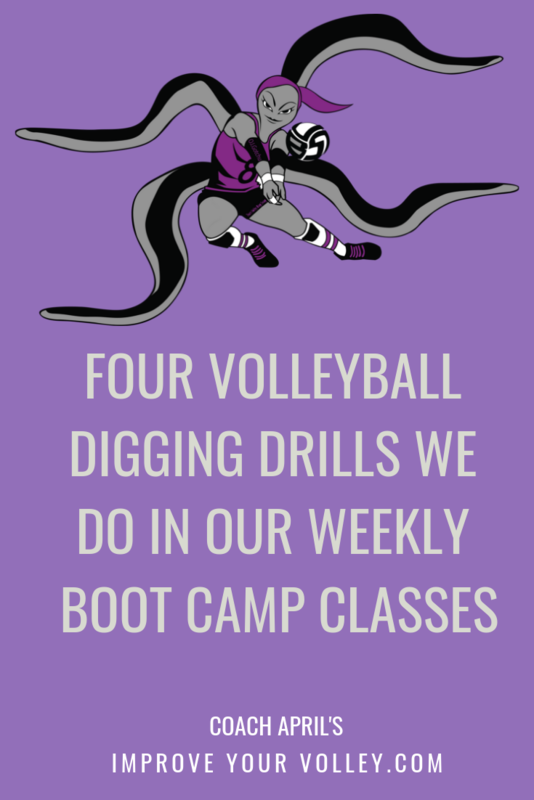 The hitting drills for volleyball practice that we do in semi private training and Boot Camp classes are to prepare outside hitters and middle blockers to hit confidently in various pressure packed situations. 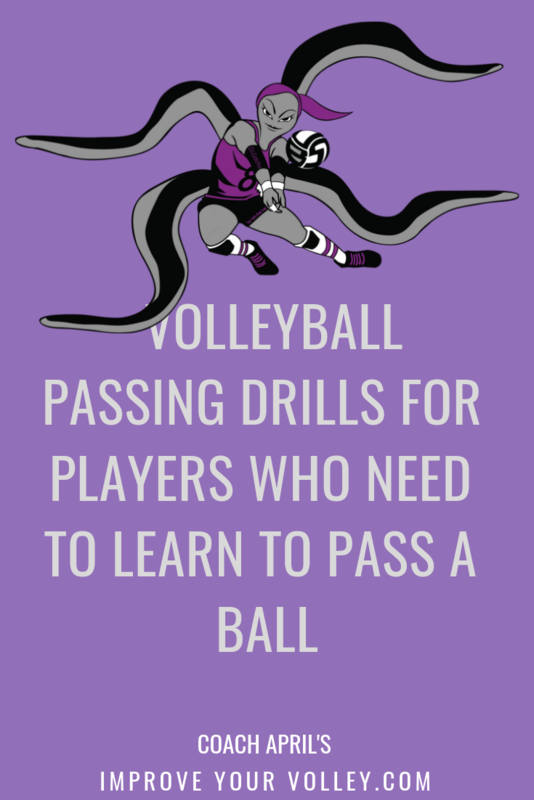 You learn how to get the ball past a double block, how to hit the high seam between blockers hands, how to wipe off the block, how to mix up shots and how to hit deep corners. 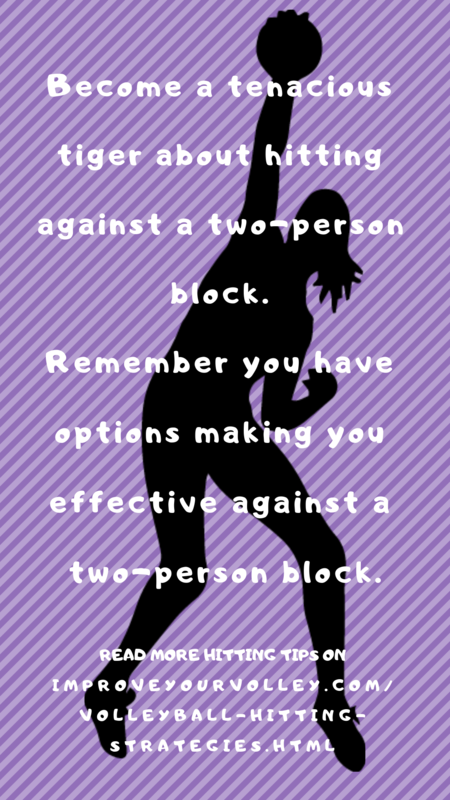 As a left side outside hitter you need to get used to having two blockers up against you when you hit since the opposing team will anticipate you receiving the majority of sets. 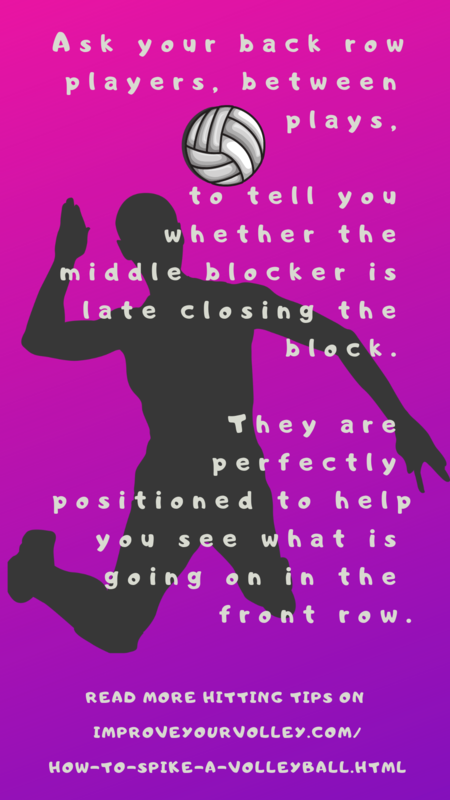 Just like the defensive players on a football team have eyes on the opposing team's running back and expect him to run the ball or catch the ball most of the time, the blockers on defense on a volleyball team keep a special eye out, always watching and anticipating the ball being set to the opposing team's left side hitter. 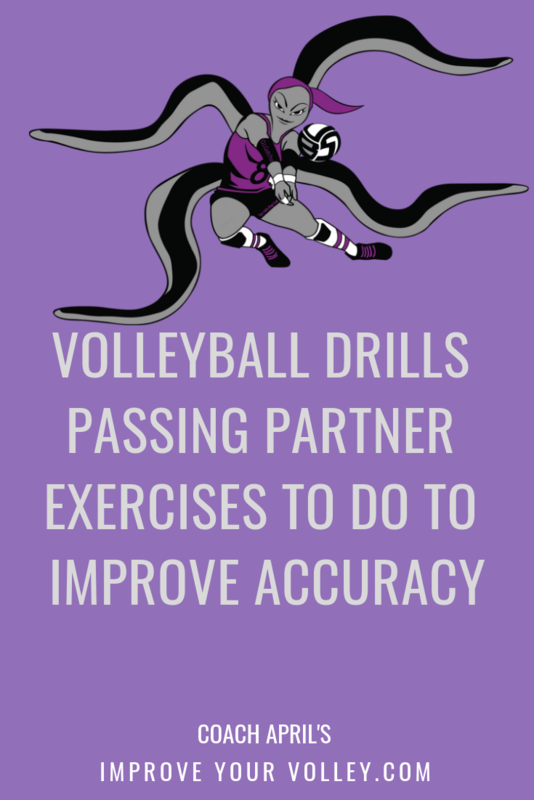 There are hitting drills for volleyball practice designed specifically for hitters to develop the ability to hit past the block, through the seam of the block or to tool the blocker's hands in an effort to score with their attack hit. 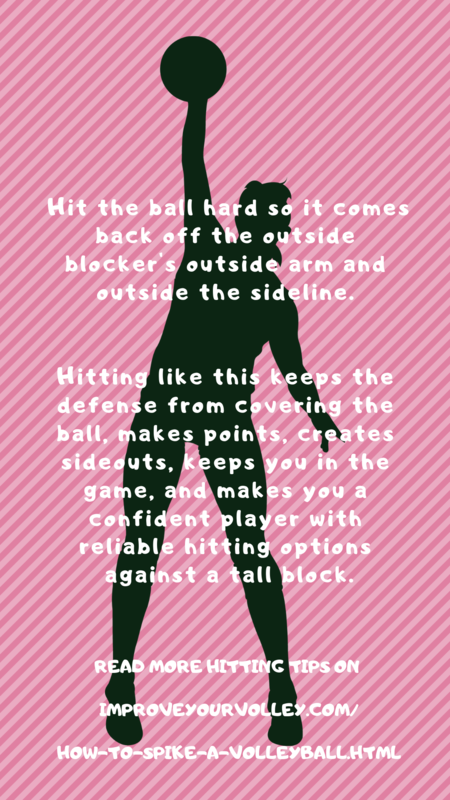 These are just a few reasons why as a hitter you need to be doing a lot of different volleyball practice drills for hitting during practices. 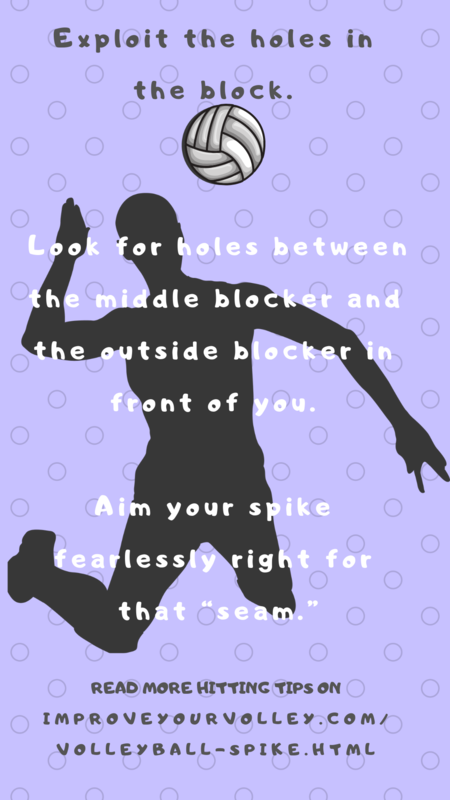 You want to be ready for all types of situations and you need to prepare to hit against a one-player, two-player or even three player block put up against you to try and stop your attack hits at the net. 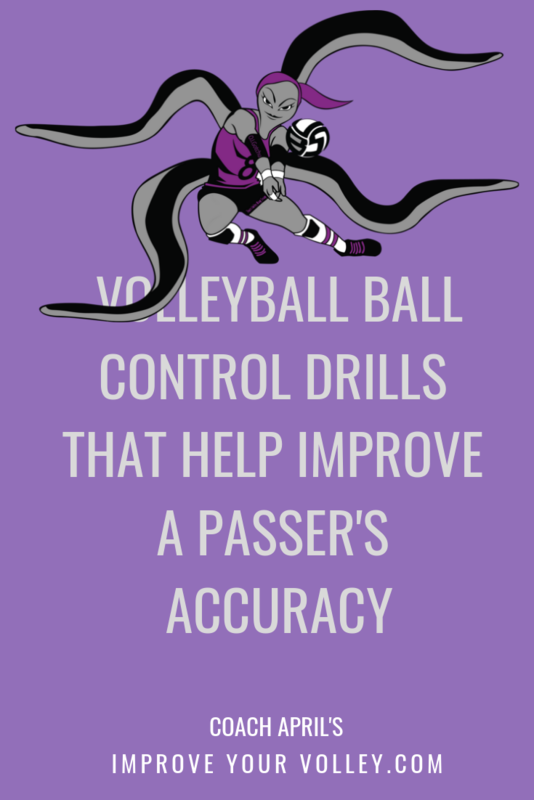 Check out my former coach, three-time USA Olympic volleyball coach Taras "Terry" Lyskevich as he explains his version of the "One Hitter vs Six Players" drill. 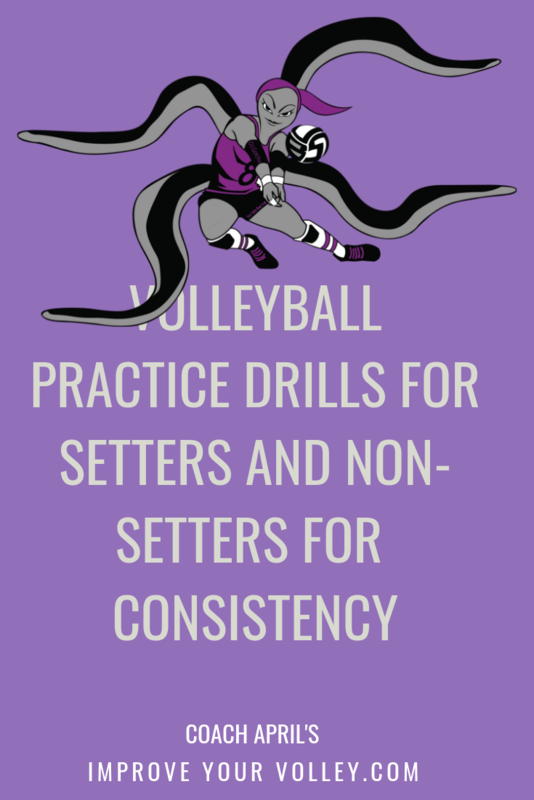 In a drill we do to practice wiping off the block I'll set up a left side hitter on one side of the net who's competing against a right side blocker on the other side of the net. 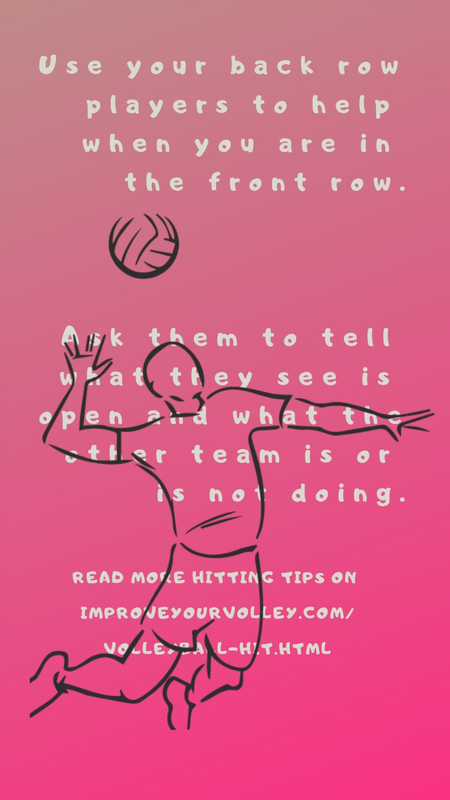 Both players start at the net with the Coach in the setter's position ready to toss balls to the hitter who will start the drill. Lets say the left side hitter starts first. When Coach slaps the ball left side hitter transitions off the net and has been instructed to only hit the ball down the line. The right side blocker has been instructed to block the line, taking the hit down the line away from the hitter. 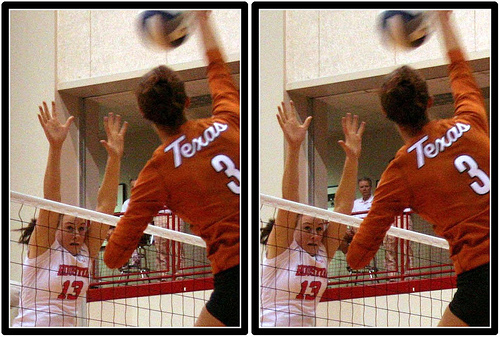 The left side hitter must now solve the problem of getting the ball past block by aiming their spiked ball at the hand of the blocker that's closest to the outside antenna. 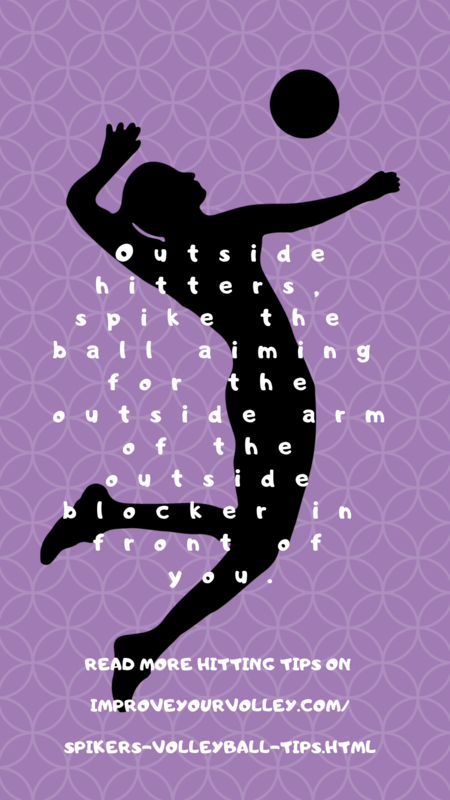 When hit correctly the hitter's ball will be "wiped off" the outside hand of the blocker and the ball will land outside the court preferably on the hitter's side. 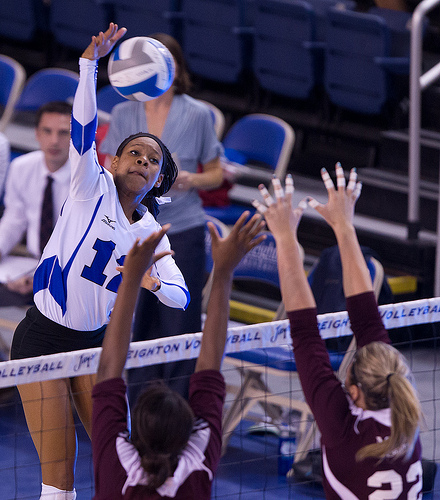 When done correctly this is a ball that cannot be picked up by opposing team diggers. 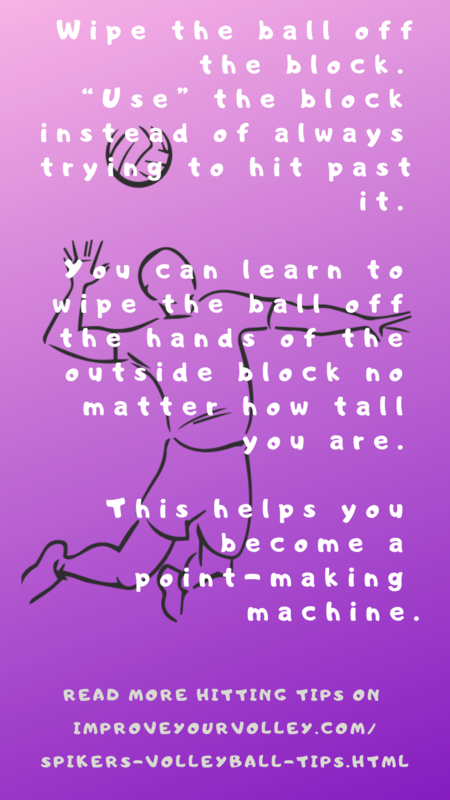 I just explained how we do our version of the wipe drill which I do with older more experienced players with ball control. 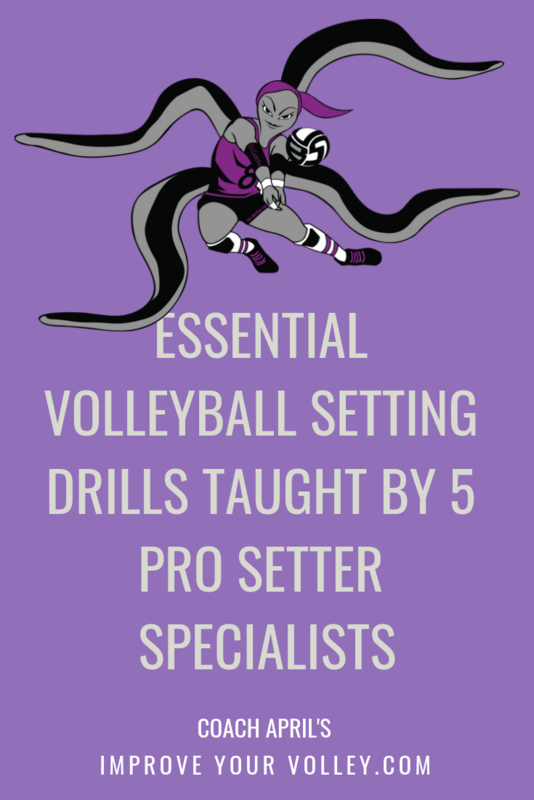 Now check out how former NCAA Division I Player of the year Cary Wendell Wallin does her version of these hitting volleyball drills. I like how she explains why she makes a few adjustments for younger players who she has doing this drill.